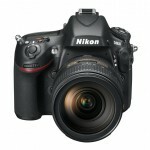 Really Right Stuff (RRS) L-plate is a quick-release plate for the Nikon D800. It uses an Arca-Swiss compatible quick release dove tail on both the base and side for quick ability to switch to vertical orientation. The one piece design provides maximum rigidity and minimum weight, providing a solid foundation for mounting the camera to your tripod. Includes: Base L-plate, 1/4-inch mounting screw and hand strap lug. Thanks Carla, the page has been updated to reflect the new design and link. I have Really Right Stuff Ballhead 55 and bracket for D700 with MB-D10. Received D800 with MD-B12 yesterday. It fits just fine with only one issue. The battery door will not open on MD-B12 with this bracket attached. In my work, I have time to remove the Allen screw if I need to change batteries and save several hundred dollars.